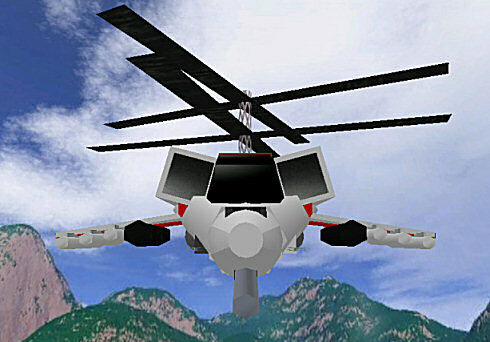 Filling the SW Navy's need for a ship-based attack helicopter, MadCorp designed the Ma-57 Sea Snake as a small, fast helicopter capable of carrying the full spectrum of weaponry. 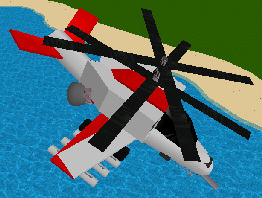 The helicopter features MadCorp's counter-rotating rotors for stability, eliminating the need for a tail rotor, along with the added weight of the extra mechanical parts. With its retracting landing gear and angular design, the radar signature of the Ma-57 is drastically reduced. The Ma-57's array of weaponry proves it to be a very versatile platform. Mounted on the nose is a 20mm cannon for attacking both personnel and light vehicle targets. Flanking the cockpit are two of NutinCo? 's SL9 strafing lasers, the first time such weapons have been used on a MadCorp military vehicle. The SL9 lasers emit short, high-energy pulses in rapid-fire, creating something like a "laser machine gun," without the need for carrying ammunition. Two stubby wings allow for the attachment of up to 6 AT-16 missiles, as well as 3-inch rocket pods. At the rear of the helicopter are two naval munitions hardpoints, allowing the Ma-57 to carry either two depth charges or 6 sonobuoys. The business end of the Ma-57.